LONDON -- When Harry Kane is enduring a rare spell of frustration in front of goal, Tottenham can always turn to Son Heung-min -- as creator or scorer. Son was taking the plaudits on Thursday -- rather than the team's top-scorer -- after the South Korean unleashed a thunderous long-range strike to rescue a 1-1 draw against West Ham. Showing no signs of exhaustion after completing a second match inside 48 hours, Son spared Tottenham from embarrassment in the 84th minute by cancelling out a similarly breath-taking strike from Pedro Obiang. In his last nine games at Tottenham's temporary Wembley home for the season, Son has now been involved in 12 goals -- scoring seven and providing five assists. Not a bad return for a player who Tottenham looked set to sell in 2016 after less than a year in north London. Little wonder manager Mauricio Pochettino is now recognizing the value of a player he acclaims for being "so humble" especially for "accepting the headlines are always for Harry or others." 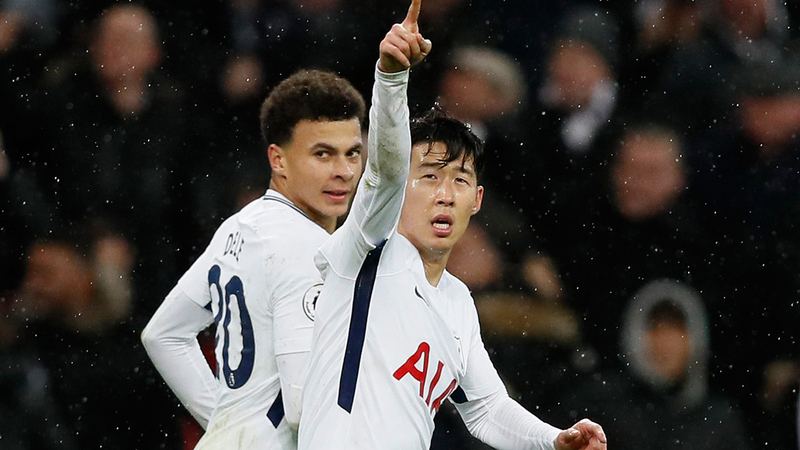 Son's 10th goal of the campaign in all competitions allowed fifth-place Tottenham to slightly close the gap on Liverpool in the fourth Champions League qualification place to three points at the climax of a packed festive Premier League program. This was a London derby completely dominated by Tottenham -- while lacking the ruthlessness required in front of goal while entrenched in West Ham territory. "This type of game you push, you push, you force, you create, you have chances to score and it's impossible to score," Pochettino said. "Only that sometimes you need some luck to open the game." That came for West Ham in the 70th minute of a London derby where Spurs goalkeeper Hugo Lloris had little to do until he was foiled by Obiang blasting from distance into the top corner with his team's only shot on target. "There was surprise and disbelief when we took the lead because Tottenham had so much of the ball and so many shots," West Ham manager David Moyes said. "It was a brilliant strike, it really was," Moyes added. "I haven't really seen him do it in training yet, I got to say, (but) he really pulled one out and it put us in a good position." West Ham moved two points clear of the relegation zone as the Premier League, which has seen 30 games in the last 10 days, takes a pause for FA Cup and League Cup fixtures over the next week. In the FA Cup third round on Sunday, Tottenham and West Ham both face third-tier teams. Tottenham hosts AFC Wimbledon and West Ham travels to Shrewsbury.